The great-grandson of Alexander Cossitt of Granby, Connecticut, was discovered in the Military Death and Burial Records at the Alderman Library at the University of Virginia on 25 July, 2011. Theodore S. Cook enlisted in the Union Army during the last year of the Civil War in his home town of Niles, Cayuga County, New York. Niles was the main recruiting station for soldiers in this area in 1864. His son, George, had enlisted in nearby Auburn, Cayuga County, New York in 1862. Both father and son were in Battery K and participated in General Grant’s Petersburg-Appomattox Campaign in November of 1864. 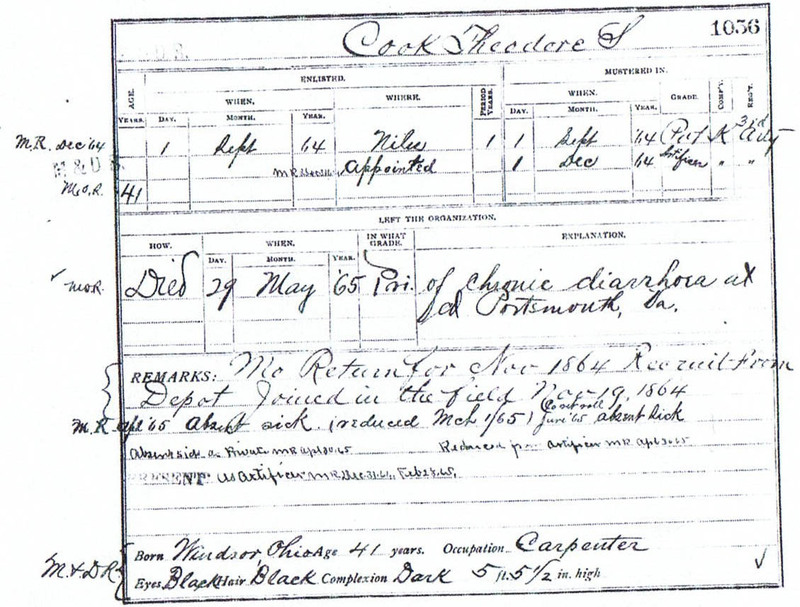 According to his Military Record, Private Theodore S. Cook of the 3rd Artillery was 41 years old, born in Windsor, Ohio, a carpenter, had black eyes and hair, a dark complexion and was 5 feet 5 and one-half inches tall. Theodore S. Cook never returned home to Niles. He died of disease, as so many soldiers did, on May 29, 1865, in Portsmouth, Virginia. George Cook returned home in June to tell his mother, Nancy Reynolds Cook, the sad news. To my knowledge, no one in my family ever knew of the parents of Theodore S. Cook. All we knew was that Theodore, and his daughter, Emeline Cook, were born in Ohio. My mother always referred to Emeline as “Grandma Cook”, even though her married name was Emeline McLaughlin. The 1865 newspaper article of the death of Theodore S. Cook was kept in our family Bible. The Alderman Library has a full-time genealogist on staff. When asked if the library had records of Civil War burial sites, she took me to a computer and showed me this site: Ancestry. Com-New York, Town Clerk’s Registers of Men Who Served in the Civil war, ca 1861-1865-Theodore S Cook. To my astonishment, it listed Theodore's parents-- Benjamin Cook and Lydia Godard. In August, I went to the State Library in Hartford, Connecticut. In searching the Connecticut Church Records, I found the Granby First Congregational Church Record listing the marriage of Lydia Godard to Benjamin Cook Jr. on 7 March 1803, along with the death of Alexander Cossitt 25 April 1820. Lydia Godard was the daughter of Lydia Cossitt, who married John Godard, and the granddaughter of Alexander Cossitt and Mindwell Wilcox. The Cook’s, along with the Holcombs and Alderman’s, removed to Windsor, Ashtabula County, Ohio, shortly after their marriage. Connecticut still laid claim to this territory from pre-Revolutionary War days and the majority of early settlers in this northeastern county were from Connecticut. 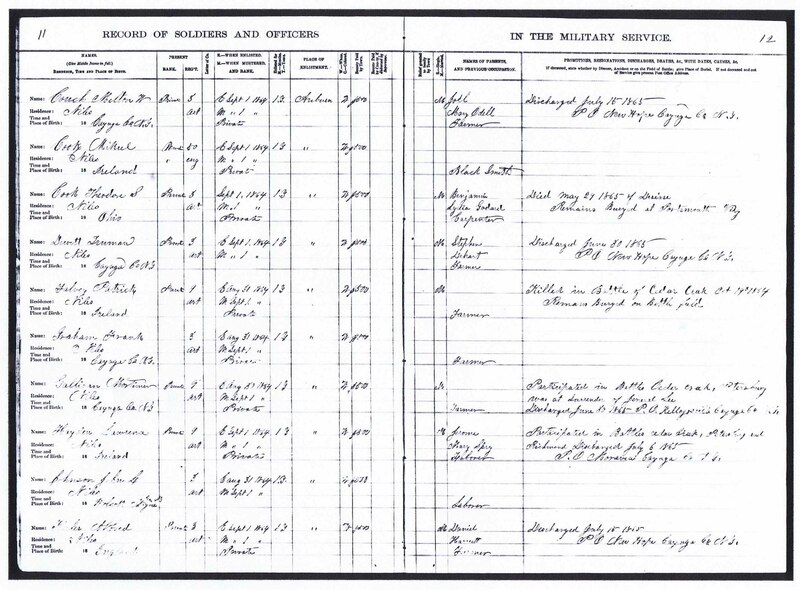 In checking the 1830 Census of Windsor, Ashtabula, Ohio, I found listed “B Cook” and “B Cook Jr” with 3 children under 20. One child was the “Youngest Son Cook,” now known to us as Theodore S. Cook, who was born in 1824 in Windsor, Ohio. Theodore S. Cook was the great-grandson of Alexander Cossitt, the son of Rene Cossitt and Ruth Elizabeth Porter. The mystery of the “Youngest Son Cook” was now solved. Thanks to David Wade Morton of Manlius, Onondaga County, New York, 7th Great-Grandson of Rene Cossitt for submitting this story. Copyright © 2012 Cossitt Family Association Inc. All Rights Reserved.